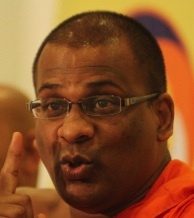 Further exposing links between the government and the Bodu Bala Sena (BBS) inadvertently; its General Secretary Galagoda Atte Gnanasara has acknowledged the allegations levelled at him by Government Minister Rajitha Senaratne, stating he only met the ‘patriotic factions of the Tamil diaspora’. While threatening to take legal action against Rajitha for statements he has made alleging links between Gnanasara and the LTTE, the monk has acknowledged his meetings with the Tamil diaspora during his foreign trips but had added none of them involved pro-LTTE factions. Few days ago Colombo Telegraph revealed the picture that is being circulated alongside Rajitha’s allegations of Gnanasara maintaining links with the Tamil diaspora and LTTE members, is in fact an image taken last year during the monk’s visit to France and that those posing on his either side are in fact strong supporters of the government. Meanwhile, it was also reported in Sri Lankan media that Gnanasara, while being questioned by the CID earlier this week over the speech he made in Aluthgama on June 15 – that has been widely held at the instigating point for the anti-Muslim violence that erupted in Southern Sri Lanka – had ‘instructed’ the CID to grill Justice Minister Rauff Hakeem instead. In his four-hour long statement, Gnanasara had rejected allegations of instigating the anti-Muslim violence and had informed the CID that those who should be held responsible are the ‘muslim extremists’ and ‘Muslim leaders who have shed crocodile tears and made deceitful claims’.